Thank you for purchasing Facebook Multi-Page/Group Poster. If you have any questions that are beyond the scope of this help file, please feel free to contact via PM at CodeCanyon. Facebook Multi Page/Group Poster (FBMPGP) is available for purchase from here: Envato Market. All files you need are inside the ZIP archive’s folder named script. A PHP capable server with PHP version 5.3 or greater. A valid Facebook App. It is free and a few steps only. Instructions below. The installation of the script is simple. But first you need to have your own Facebook Application. You can create your Facebook Application easily and for free, by following these steps. Sign up for the developers account, if you have not done so already, by clicking on Get Started. When sign up is complete, you will see My Apps menu. Give your new app a name, anything you like, and also provide your contact email. Next, you will see your app dashboard. Now we need to adjust some settings of this app. And to do that, go to settings, basic. First thing we need to set is app domain. App domain is just another name for your site domain, where the script is installed. It is not the full URL, just the domain name. Choose a category for your app. We will select Utilities. Now scroll down and click on Add platform. Choose Website, and provide your full script URL. Now we will check advanced settings. So click Advanced. Here you just need to change Allow API Access to App Settings to Yes. Finally, we need to add a product to our app. The sidebar area is for products, so click the + sign and select Facebook Login. It will be added, and you will see its settings button in the side menu. Click it to go there. And here we need to fill the valid oAuth Redirect URIs field. We need to put two values in here. First value is your complete script URL. It must start with HTTPS. Second URL is the same as your first one but with index.php added at the end. Note there must not be any trailing slash at the end of this second input. Now the app setup is complete, and we need to publish this app by going to App Review. You will need your App ID and App Secret for the script, which you can obtain by going to Settings->Basic again. Extract all files to a directory on your hard-disk, preserving the folder structure. Upon extraction, you will see a folder named script . This folder contains the files that must be uploaded to your server. Upload all the files and folders inside “script” folder to your server. Note that you can upload files to your server main folder or any sub-folder. You can use any FTP client, like for example, FileZilla, for uploading files to your server. FTP Access credentials can be obtained from your hosting cPanel or hosting support. Alternatively, you may upload using your hosting/cPanel native file manager as well. If you are not sure how to use an either method, contact your hosting provider to help you. Make sure your uploaded folder has 775 permissions. Open the script URL in your browser. The Database Prefix is the prefix used for all SQLite databases created by this script. You may set it to a unique value to increase security of databases. The .htaccess file present with the script prevents any download of database files, so make sure your server honors the .htaccess files. The Encryption Key is used to encrypt sensitive data like passwords. You may leave it at its default value or change it to your own liking. Note that the length of Encryption Key must be exactly 8 characters. Enter your Facebook Application ID and Facebook Application Secret as noted in step C-1-19. 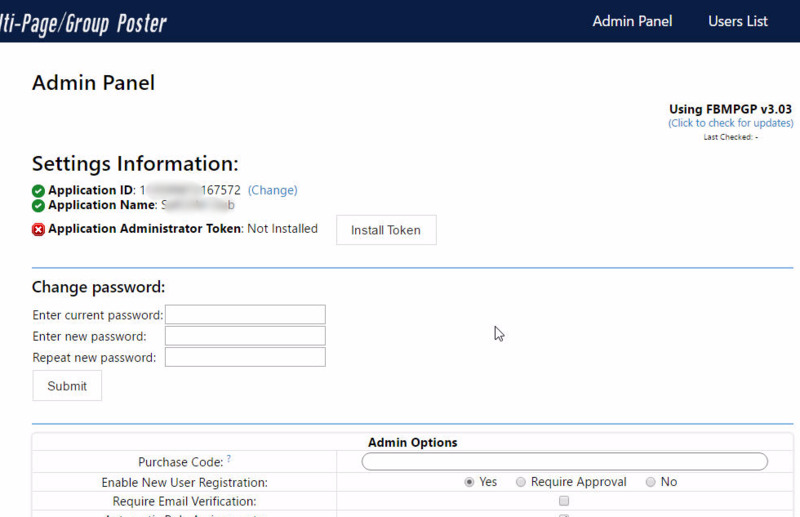 Choose a username and password for the administrator account that will be used to access the Admin Panel, and click Submit . Remember, the admin user will only be used for script administration, not for posting. You will need to sign-up later as a user to start posting. Upon submitting, the Admin Panel should appear. The Admin Panel is used to configure various settings as well as viewing list of users and active CRON posts, and enabling/disabling/deleting them. VERY IMPORTANT: First things first. . You need to make sure that you are using the latest version. On the top right, you are shown your version number as well as a link to quick check for update. Click on “Click to Check for Updates” to check for the latest version. Script will ask you for your purchase code, which you can easily find using your CodeCanyon/Envato/Themeforest account. (Animated Instruction for finding purchase code: http://i.imgur.com/wFF7VMD.gif). If a new update has been released, you will be notified in this area and with a single click, you can update to latest version. No hassle and no re-uploading files for updates. Cool isn’t it? Okay once you have ascertained that you area using the latest version, then let’s move on to the rest of the Admin Panel. The first three status lines in the Admin Panel show you the status of your Application (whether it is valid or not), and the status of Application Administrator Token. The Application Administrator Token, or AAT is used for various internal functionalities. To install the AAT, simply click the adjacent button and you will be asked for permissions by Facebook. Once you accept the permissions, you will be redirected back to the Admin Panel and AAT will be shown as installed. Enable Demo Mode will limit users to maximum 5 groups each and disable video postings. This is intended mainly for our Online Demo, and so you should always keep it disabled (unchecked). Automatic Role Assignments setting automatically assigns each new user the tester role, so that he may start posting without any manual requirement to assign him the ‘Tester’ role in FB APP dashboard>>Roles. If you would like to manually approve and assign each new user, you may disable this setting. This setting is only needed if you have an officially white-listed Facebook App submitted and approved by Facebook after review. For all other cases, users can obtain a third party access token from their control panel and start posting without need of any role. Minimum Delay is the absolute minimum delay value that users will have to choose while posting. They cannot lower the delay anymore than its value. Default Delay is the delay value selected by default in the delay list box. It should be equal to, or higher than minimum delay. imgur.com Client ID: Needed for image upload functionality. Default value is provided and is valid. If the field is empty, or the image upload functionality is not working, you can create and use a new Client ID by clicking “click to create” text shown below this setting. CRON Job is necessary for scheduling posts to groups and various other important functionalities. CRON is necessary for script to function properly. You can use the script without configuring CRON, but several functionalities will not be available. So let’s configure CRON job for the script. If you do not know what a CRON job is, then let it be known that a CRON Job simply means a task on your server that executes with regular intervals and upon each run, runs a PHP script file present on the server. You can setup a CRON job in two ways. By Using your cPanel (WebHosting). By using an external CRON service. You may use an external CRON service like EasyCRON that simply accesses the desired file on your server at regular times, thus executing the cron.php. Point the external service to the URL of cron.php file to begin executing crons. After setting up the CRON Job, be sure to enable CRON Scheduling in your script’s Admin Panel and save settings. If the CRON job is running fine, you should see a green check-mark below this setting showing last cron run time, after a few minutes. Refresh the page if the mark is yellow. If it does not show green check even after 10 minutes, the CRON job may not have been configured correctly. Installation is now complete. Have a drink, relax and let the script work completely automatically from now on. 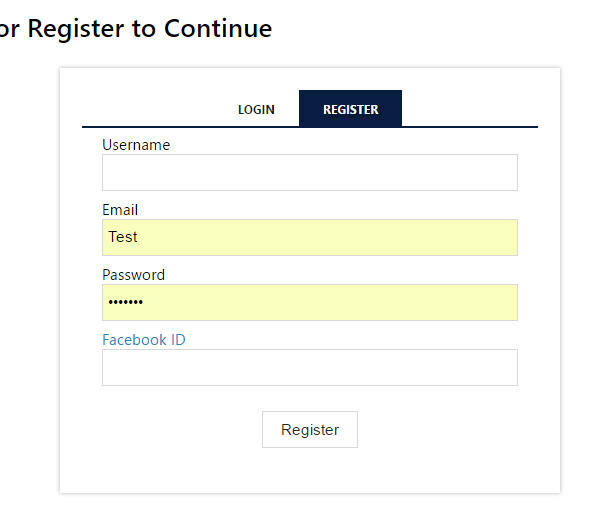 Its time to actually sign-up to the script as a user, so if you are logged in as the administrator, click Logout in the menu. You will now see the login/sign-up screen. Lets create a new user. 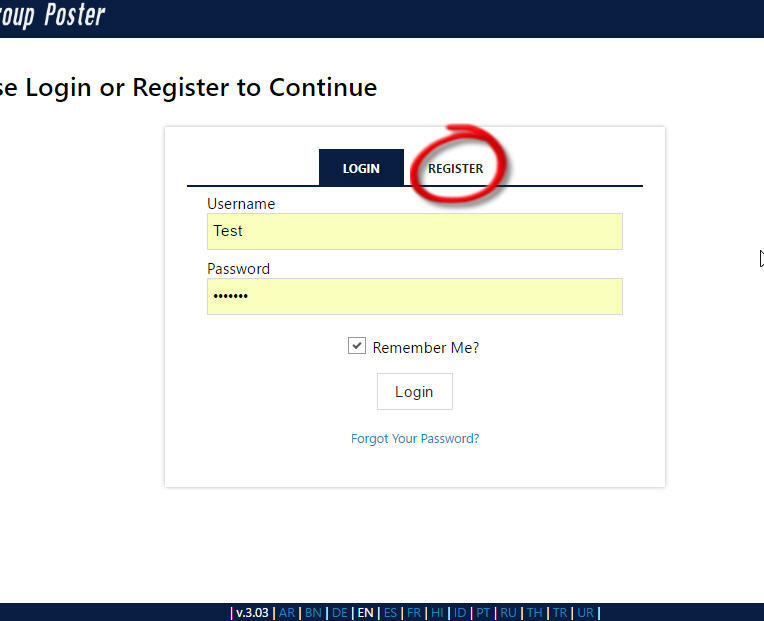 Click Register in the login/sign-up screen. Enter your details and signup. and paste into the external website page, and press Lookup Numeric ID . You will be given your Facebook User ID. This user id is all numbers, no alphabets. Copy this user ID, and return to the sign-up window (tab), and enter all details. You will see a screen with message saying that you have not yet authorized the application on Facebook. Click the Enter Access Token button on that screen. After which you can get and input any third party app token for posting. After completing these steps, when you return to the script, you will be shown the posting screen with your pages and groups below. That’s it, you now can make your very first post. Login to the application if not logged in already. After successfully logging in, you will be taken to post creation page as shown above. 1. Now, first of all, select the type of post you wish to make. For our quick start example, we shall make a text post, which is selected by default. 2. Next, input the required content of the post. For text post, simply enter the text message in the text message box. 3. If you wish to publish the post as soon as you press post, leave the “When to Post” areas blank. If you want to schedule this post to a later time, enter date and time. Simply click on the boxes, selection boxes will pop out and you can select the date and time from it. Make sure the Timezone selection box is displaying your correct timezone. 4. The list of pages and groups to which you are an admin or member are displayed at bottom. You can also select your Profile to post to your own timeline. Select the pages and groups to which you wish to make this post. Shortcuts are available to select all groups, all pages or to deselect all. 5. Finally, press the “Post” button to begin publishing/scheduling the post. Each page/group will be sent the post with the delay specified in the config.php file, which, by default is 5 seconds. The “Post” button will be disabled while posting is in progress, and will enable itself once the process is completed. 6. You will see the status of each page/group publication within its box. If successful, success message will be shown alongwith the post link. If any error occurs, it will be shown as well. See the image below. 7. That concludes the quick start of posting process. From now on, you may try other post types as well. The fields for each post type are different, but self-explanatory. Five types of posts are possible for pages, for group, two are available. If you select an unsupported post type for group posting, it will be automatically adjusted and posted as link. Message (Required): Simply enter the text for the post. Link URL (Required): URL of the Link. Message (Optional): A Message accompanying the Link. Link Title (Optional): Title for the link. If left blank, it will be fetched automatically from the URL. Link Description (Optional): A short description of the link. If left blank, it will be fetched automatically from the URL. Link Caption (Optional): Link caption. If left blank, it will be fetched automatically from the URL. Picture URL (Optional): An image for the link. If left blank, it will be fetched automatically from the URL. You can specify many fields for the link, and all of them are optional except the link url. A link and its parameters appear as below in the Facebook feed. Image Description (Optional): A message/caption accompanying the image. Image URL (Required): Online URL from where to fetch the image. You can check “Use Image Proxy” checkbox to use images that watermark or otherwise deny Facebook image fetch. 4. Album Post Album post is almost the same as image post, except that when you click on “POST”, you will need to specify the album to which you want to post for each selected page. Groups do not have albums, nor photos, so for them the post will be published as link. Video Title (Optional): Title/Caption of the Video. Video Description (Optional): A message/caption/description accompanying the video. Video URL (Required): Online URL from where to fetch the video. Copyright © 2019 Sarir Softwares Pvt. Ltd. - All rights reserved.